E-Katalog, a Russian retailer, has put the entire line of Ryzen 3000 desktop CPUs (the 'Matisse' series) on its website. These listings may indeed just be placeholders; on the other hand, they contain detailed information on processors such as the Ryzen 9 3800X. It suggests that the new generation has seriously outpaced its predecessor, especially at the higher end. AMD is said to have planned a launch event for the long-awaited Ryzen 3000 series at CES this year. However, a number of these new CPUs may have had their details leaked by a preliminary set of retail pages posted by the Russian retailer E-Katalog. These listings purportedly include their specs, including their model names, clockspeeds and TDPs. The processors in question are those that have gone under the code-name Matisse until now. 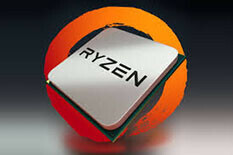 Should this information prove accurate, it indicates that the flagship of this line, the Ryzen 9 3800X, may be capable of outstripping its predecessor by a good margin. Its listing asserts that its core- and thread-counts are no less than 16 and 32 respectively. This means that both specs have been doubled compared to the Ryzen 7 2700X of last year. The putative 3800X's base clock is 3.9GHz, with a boost clock of 4.7GHz. Again, this outdoes the 2700X, by 0.2GHz and 0.4GHz respectively. The TDP of this supposed next-gen chipset is listed as 125W, or 20W more than its Ryzen 2000 counterpart. The E-Katalog website also now contains details on other 3000-series Matisse processors. They range from the Ryzen 7 3700X (with 12 cores and 24 threads, clocked at 4.2 to 5.0 GHz and with a TDP of 105W) to the Ryzen 3 3300 (6 cores/12 threads, 3.2-4.0 GHz and a 50W TDP). On the other hand, there are some discrepancies between the new Matisse series and its predecessor. Only 2 new Ryzen 5 processors are listed, rather than the 3 from last year, and there are no G-type (e.g. the Ryzen 3 2600G) processors this time around. However, AMD's upcoming CES showcase should clear this up, and confirm these new listings, in short order.